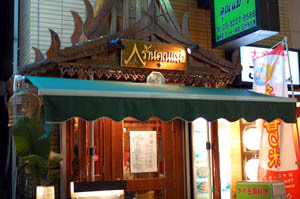 The main branch of this popular Thai restaurant is simply called Khun Mae and is located a few doors down the road; the confusingly named Khun Mae 1 handles some of the overflow. (Apparently they start their numbering at zero.) Whichever number you choose, the food is reliable, fairly authentic, and reasonably priced. 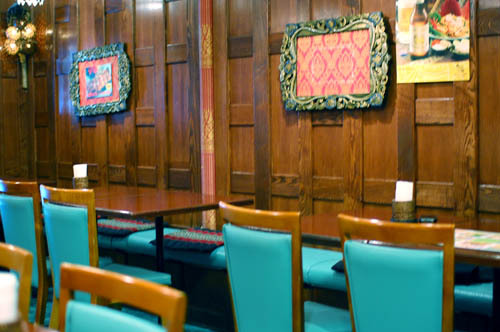 In addition to curries and other Thai standards, the extensive dinner menu includes chef's specials such as deep-fried black sea bream with garlic sauce; soft-shell crabs stir-fried with black pepper; raw shrimps with spicy sauce; and Isaan-style sour sausages. If you're on your own and on a budget, there's also a selection of five set dinners priced at Y1260. 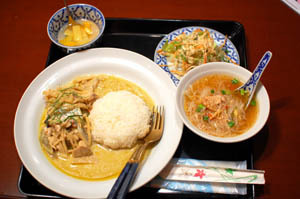 During the daytime you can choose from sixteen main dishes as part of the Y840 lunch special, which also includes a bit of salad, a tiny dessert, and a drinks buffet with hot or iced coffee, iced Thai tea (an interesting vanilla-ish flavor), and mango and grapefruit juices. For an extra Y105 you can add on a mini-bowl of Thai ramen.